stolen trailer - The Claresholm RCMP are investigating the theft of this trailer, last seen in the Porcupine Hills on East Trout Creek. 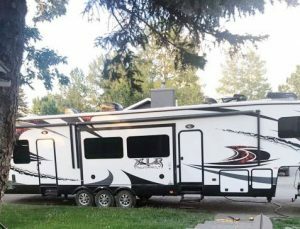 The Claresholm RCMP are seeking the public’s assistance in recovering a stolen trailer. On Aug. 14, the police received a complaint of a theft of trailer. The trailer was parked in the Porcupine Hills on East Trout Creek near Claresholm. The trailer is described as a white 2014 Forest River XLR with Alberta licence plate number ZU273. Anyone with information on this theft, or any crime, is encouraged to contact the Claresholm RCMP at 403-625-4445 or Crime Stoppers at 1-800-222-8477 (TIPS) for a reward.